Published Aug 5, 2014 by Prentice Hall. Part of the LiveLessons series. 8+ hours of video instruction PLUS quiz questions to help you learn even faster! The professional programmer’s Deitel® video guide to Java™ SE 7 and SE 8 development with the powerful Java™ platform, enhanced with HTML5-based quizzes to help you learn even faster! This online course is the professional programmer’s guide to Java SE 7 and SE 8 development, enhanced with interactive quizzes to help you learn even faster! 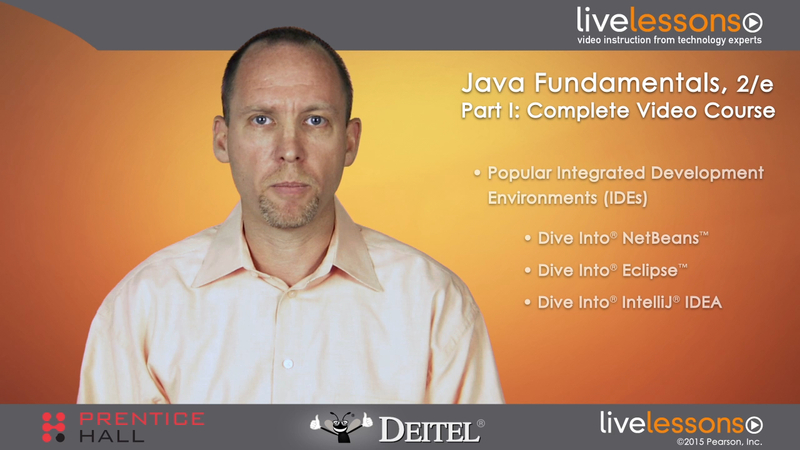 With 8+ hours of instruction, Java Fundamentals Part I applies the Deitel signature live-code approach to teaching and explores the language and APIs in depth. Concepts are presented in the context of fully tested programs. The course features hundreds of complete programs with thousands of lines of proven Java™ code along with hundreds of tips that will help you build robust applications. The videos in this course are the same as the videos in Java Fundamentals LiveLessons Part I of IV. Do NOT purchase this course if you have already bought Java Fundamentals LiveLessons Part I of IV. Begin with a tutorial on setting up your Java environment, then with tutorials on using the most popular Java IDEs: NetBeans, Eclipse, and IntelliJ. Then begin exploring Java development. Deitel uses an "early objects" approach in this video, so you are immediately immersed in the world of Java Classes, Objects, and Methods. You then learn about the key Control Statements in Java used to manage program flow. And the video finishes with a deeper exploration of Java methods and a powerful treatment of arrays in Java.